I know some folks love them, some hate them. I like them a lot BUT, even using a sharp knife (eg Takeda Petty), I find cutting off the [rotten] stems monotonous. For you pros out there - and dedicated home cooks - how do you do this other than one at a time? I like to chop them. I often use a nakiri for Brussels. 3" artifex paring in hand, same as nmiller. Just takes some time. And dont be shy about trimming just above the stem to pull off a few outer leaves...gets to the more tender parts. I'm a sucker for balsamic glaze, shallots, bacon, parm. Maybe some fresh sage and/or splash of brandy if I'm feelin frisky. The first four are tired and done to death, but damn they make me happy. I find them and carrots to be best right after first frost - lots of people up here wait until then to buy the things - seems to force a lot of sugar into them. But I'm gonna make them for dinner tomorrow - have a nice stem on the counter right now. Costco lamb rack is in fridge waiting as well. 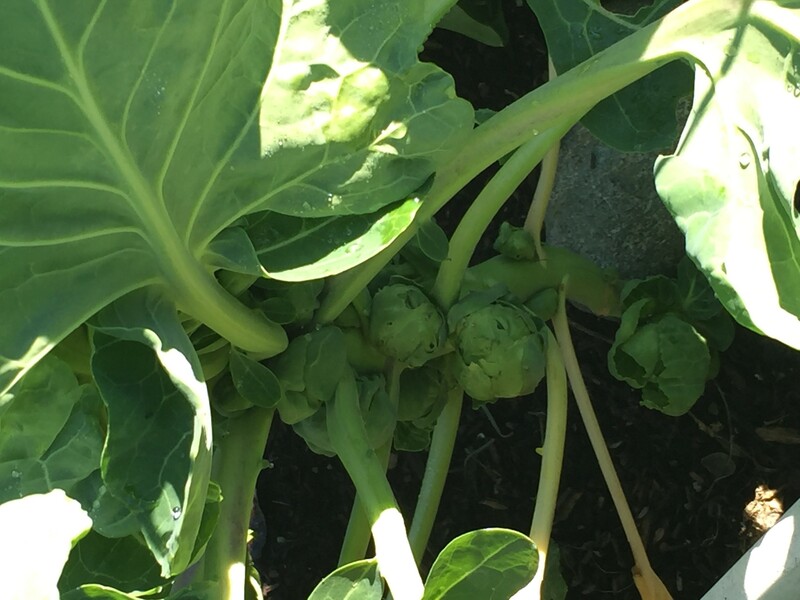 If you can find them on the stalk, it's easy to cut off without the bad part of the stem - just hit them right where the leaves start - takes far less time than you think. You can try lining them up together on a board and cutting more than one at a time, but Brussels aren’t all the same and the stems differ in length. Unfortunately, the best way is one at a time, mostly for quality control and to not lose much of the product. toss in apple cider vinegar with shallots and a touch of butter / salt. That's a great way to cook sprouts - I think I'll get some soon. Met a german girl who boiled these a bit, then rendered some bacon fat and gave em a slow saute. Big ones of course had to be cut in half. Edges get carmelized and the bacon tones down the sprout flavor a bit. I was a fan after that!. These are in my winter garden now with a bit to go. Quarter them one at a time, place them in a large bowl, drizzle with EVOO, balsamic vinegar, shezuan peppercorns, sea salt, and place them on the bed of the preheated 350’ oven, no rack in a bigass serving pan for 35 minutes. The bed of the oven gets hot AF, so they will actually brown nicely. I use a gyuto, but I often do all the stems first, then go back and halve or quarter separately, and if leaves come loose I often scrap them because they are often the least pleasant exterior ones. This also has the advantage of not having the stem bits re-mix with the halves and quarters on the board, so it is much quicker to cut, move, and scoop everything. Definitely a one at a time job. I generally do it on a board with a large petty. It's a job that I kind of enjoy though. I make a slaw with grainy mustard, cider vinegar, olive oil, salt, a touch of sugar and caraway seeds. I slice them thin on a mandolin, using that stem to hold onto it and save my fingers from mutilation. The trick is, actually, music. Put on a song that goes as close to ten minutes as possible and just get into the zen of cutting up each individual sprout. Dylan’s Sad Eyed Lady of the Lowlands exceeds 10 minutes. For something a bit more fun, though under ten minutes, go for The Doors Light my Fire. Just keep cutting, and keep trucking. Or grooving, or whatever. Sprouts beg for individual attention, whatever your music tastes. Is it obvious that I went off to college in 1968? ---- Pre balsamic Vin. Just some outdoor fun. Love reading everyones way of preparing these. I didn't have much hope for this thread. I guess the basics are that it is just a one at a time task, BUT I'm amazed at the great response on the topic. Thanks to all! Cut mine one at a time,boil,then saute with some smoked bacon then sprinkle a little sea salt on them. I cut them high, i.e. with a few lower leaves from the stalk with a stiff 150mm petty like my Teruyasu Fujiwara. Then slice in half and toss with EVOO, salt and broil until brown. Drizzle with a balsamic vinegar reduction and dip 'em in garlic aoli with bacon bits...my mouth waters just describing them. They are great sliced very thin and used in different asian stir fries too.